You may wish to see a page on the walls of the town first. We began our walk at the first, or eastern gate, which has no opposite one worth examining, at the point where the lake Ascanius approaches the city. Three portals are passed in succession at some yards distance. They were certainly built in haste, or were very rudely connected with the original entrance. An earthquake destroyed Nicaea in 123 AD and the town was redesigned and rebuilt during the reign of Emperor Hadrian. The gate was initially a triumphal arch marking the official limit of the town. In 267 the Heruli sacked Athens and the Roman Emperors promoted the construction of walls to protect the main cities, including Rome, from similar raids. 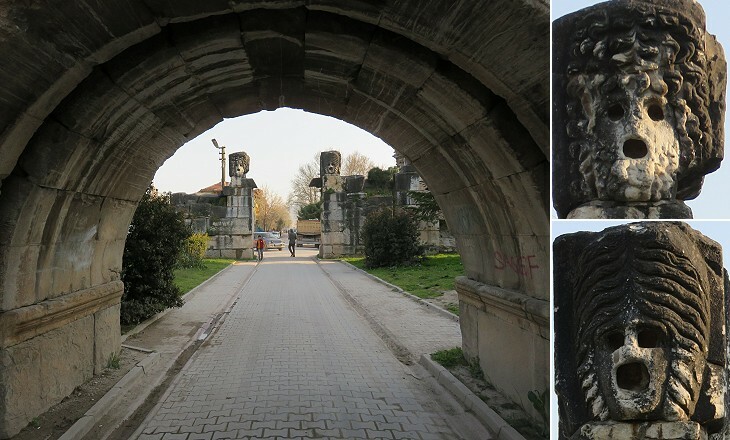 Emperor Claudius II (268-70) fortified Nicaea by building walls which incorporated this and two other triumphal arches. In the early XIIIth century a new outer enclosure was built by Theodor I Lascaris, Emperor of Nicaea. 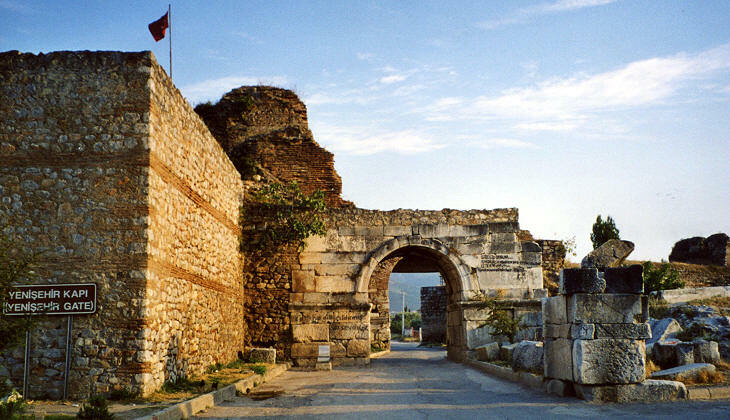 Dallaway most likely entered Nicaea at the Northern Gate as he was travelling from Constantinople to Bursa, which is situated south of the town. At this gate there are two large reliefs of Medusa's heads, with victories over them. The descriptions of ancient reliefs or statues made by foreign travellers who visited Nicaea have helped the retrieval of some of them. Pococke saw two Heads of Medusa, Dallaway only one, but that which was missing was eventually found. The Heads of Medusa had an apotropaic significance i.e. they protected the town from evil (and enemies). The second, or northern gate, called Karadan Kapisi (Black Gate), opening to the plain, has likewise three divisions (..) the outer portal is composed of three vast columns of porphyry, ten feet in length, one of which serves for the impost. On one side is carved a group being a combat of horsemen, on the other several female figures (..). Little doubt can be entertained but that these walls were constructed from the spoils of an adjacent temple. J. Dallaway. 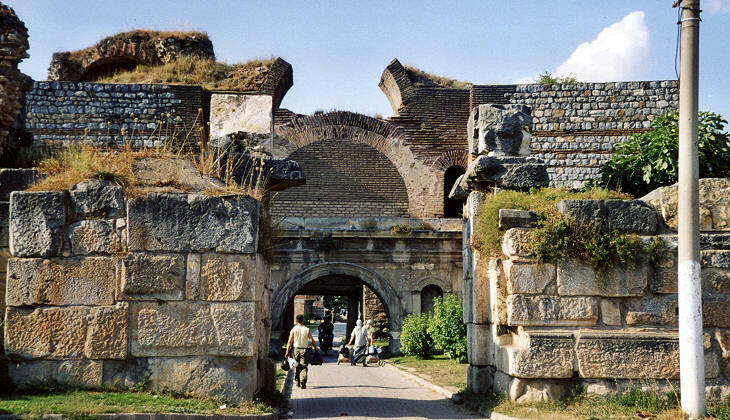 The triumphal arches which became gates in the IIIrd century gave access to a small closed courtyard with a second gate (similar to what can be seen at Porta S. Paolo in Rome). The third outer gate (or portal according to Dallaway) was built in the XIIIth century. 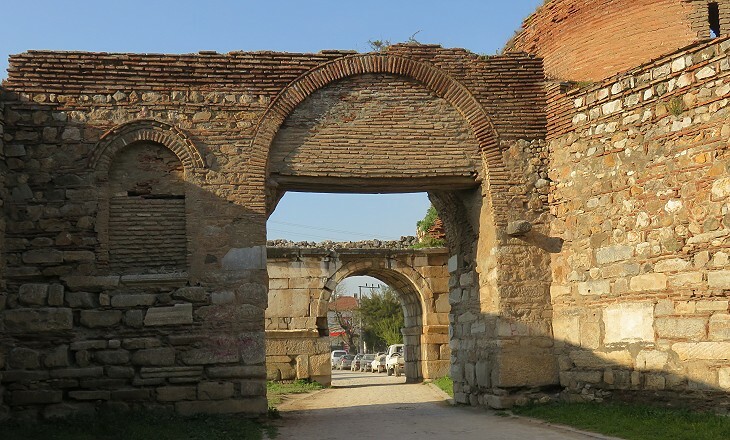 The Northern Gate was situated at one end of Cardo Maximus, the main north-south street of a Roman town, which most likely was colonnaded and ended after more than a mile at the Southern Gate with another triumphal arch. The Southern Gate must have been very similar to the Northern and the Eastern ones, but its inner gate is almost entirely lost with only a pile of ancient stones indicating its location. 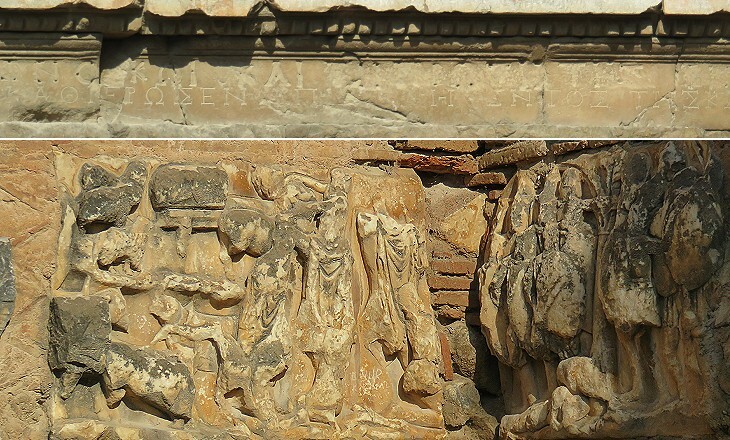 The former triumphal arch did not have the same level of decoration (niches, inscriptions, etc.) as the other ones. In 1261 the Emperors of Nicaea managed to seize Constantinople and moved their residence there. The new Byzantine Empire was very different from that which collapsed in 1204. Its territory was rather small and its capital was oversized, although still very rich because Constantinople had retained its importance as a trading centre. The last Byzantine Emperors relied on their gold and their diplomatic skills to keep afloat their Empire. About 1300 they made their first acquaintance with a Turkoman tribe, led by Osman I (hence the name of Ottoman). The Ottomans were vassals of the Seljuk emir of Kastamonu and they had been settled by the latter near the border with the Byzantine Empire so that their raids in search of booty would not affect his possessions. Osman gained control of the passes leading from the Anatolian tableland to the plains of Bithynia and conquered Yenisehir, a town a few miles south of Nicaea. In 1328 he laid siege to the latter. 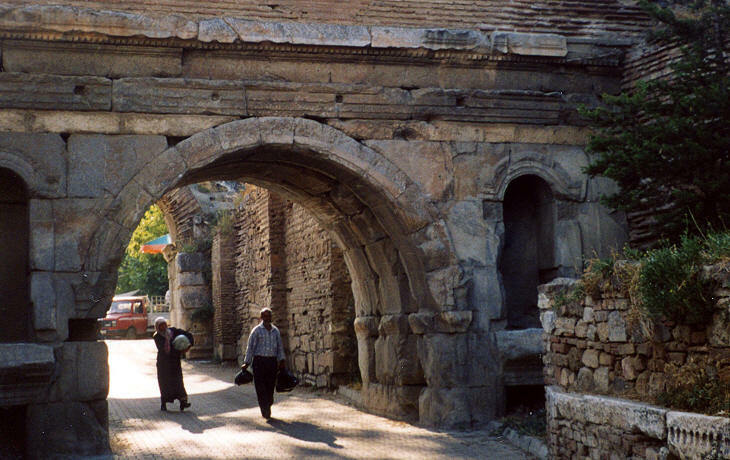 In 1331 Orhan, his son and the first Ottoman Sultan, entered Nicaea through the Southern Gate. 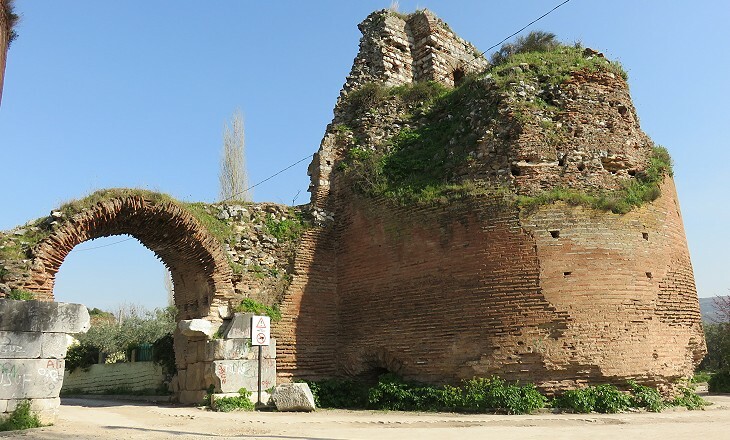 Sultan Orhan Gazi (the Victorious) resided for some time at Nicaea in a palace (Turkish: saray) at the south-western corner of the town which most likely included the ancient Roman theatre. 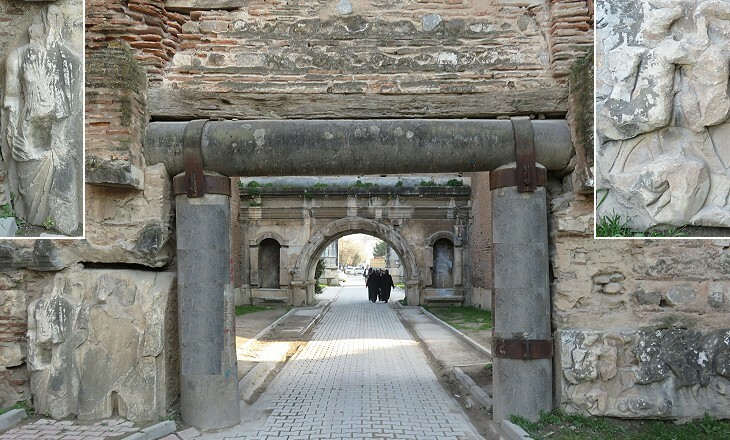 A gate was opened in the walls to allow the Sultan to easily enter or leave his palace. 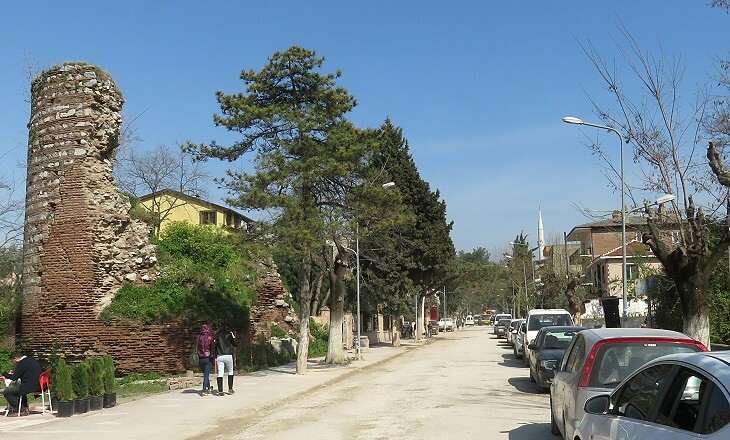 The Lake Gate is a modern opening between two Byzantine towers which allows the inhabitants of modern Iznik to reach a promenade by the lake with fish restaurants, coffee-shops and amusements. Perhaps one day the Western Gate of the ancient town will be found in the waters of the lake, but it is possible that such a gate did not exist at all.